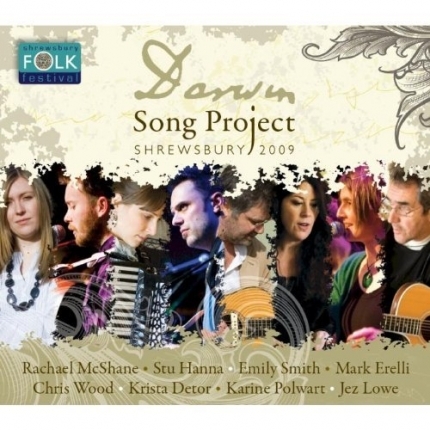 In March 2009 eight artists gathered together in rural Shropshire for a week long songwriting retreat, to create new works that have a ‘resonance and relevance’ to Darwin – who was born in Shrewsbury in 1809. The eight artists cover a wide range of songwriting experience and styles – from the experience of Chris Wood and Jez Lowe, through to the youth of Rachael McShane and Stu Hanna. Bringing in two celebrated American singer/songwriters in Mark Erelli and Krista Detor, alongside Karine Polwart and Emily Smith who have both previously being involved in similar collaborative events, gave the perfect artistic balance for the project. The CD captures 17 of the songs performed on the night, and features all 8 artists in both lead and supporting roles, culminating in Woods’ ensemble piece. The songs cover all aspects of Darwin’s life and legacy, and as you’d expect from the pedigree of artists involved, the quality of the songs and performances is exceptional. The live CD has been beautifully mixed by Stu Hanna (who is currently producing the new Show of Hands disc), and it captures the magic of these songs on their first public performance. Many of the songs are already finding their way in the Darwin artists’ individual live repertoire. The Darwin Song Project has already been the subject of a dedicated BBC Radio 4 documentary and was featured on Mike Harding’s BBC Radio 2 show with interviews and songs.